Do you have an extra-large family or run a small restaurant? Then we probably don’t have to tell you how expensive it can be to buy smoked meats. These delicacies are an absolute must whenever you feel like treating your family and friends. Smoked meats and foods offer a lip-smacking aroma that no other food preparation method can mimic or provide. If you want to start treating yourself, customers or family and friends with these delicious foods on a regular basis without breaking your budget then it is high time to invest in a smoker. We highly recommend the Smoke Hollow 3616DEWS because, not only is it big enough for your extra-large family, it also comes with a tempered glass door that enhances the ease and convenience of smoke cooking foods. One of the first things you will notice about this 36” smoker is the beautiful design. It is absolutely eye-catching thanks to its sleek matt black design and especially thanks to the tempered glass door and internal light. The glass door makes it easy to see how your food is doing, gives everyone a charming glimpse of the delights while they are being smoked and simply enhances the overall appeal of your cooking experiences. Digital control – The digital controls with LED display makes it incredibly easy to precisely smoke different types of food to your exact need. Simply push a few buttons and you have full control over the temperature, time and even fast smoke functions. Sideloading smoke tray– If you hate opening your smoker just to add more wood chips then you will love this smoker. IT is fitted with a side smoke tray that allows you to add more wood chips without having to open the smoker to cause a loss in temperature or smoke. 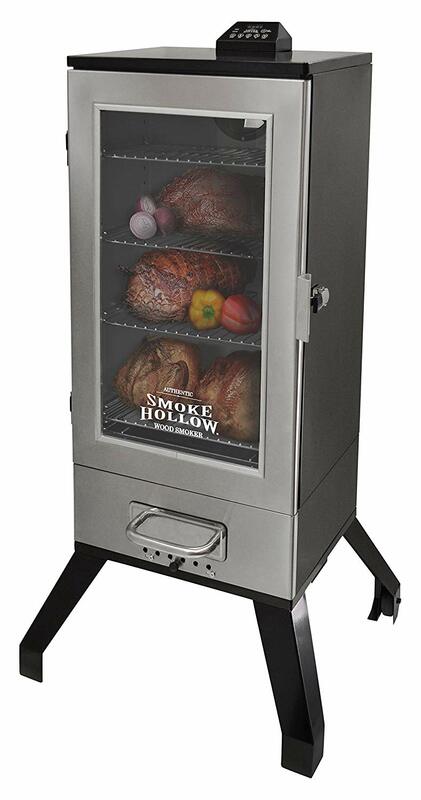 Size – This is one of the bigger smokers on the market. The 36” smoker has a 20 dimension of 20.6 x 23.3 x 47.5 inches with a whopping 3.0 cu.ft food loading capacity. Max temperature – This 1500 watt smoker can reach a max temperature of 250 degrees within minutes and is all the heat you will ever need for preparing bulk food quantities.